It’s a new year and a new you. You deserve to treat yourself and find aesthetic satisfaction this year! Think about it- what would you improve if you could? Many find themselves wanting to look more youthful or vibrant. Botox©, Dysport™ and Xeomin© are injectable neuromuscular-blocking toxins that are commonly used to correct wrinkles in the face and neck. These products are non-surgical treatments that temporarily soften frown lines, crow’s feet, and forehead creases. Those who have crow’s feet, deep furrows in their brows, deep nasolabial folds, and other facial wrinkles often use this facial injectable to correct the signs of aging. But those are not the only options available to you at ARC. You could also choose a more natural filler like Restylane®. Restylane® is a facial filler made with hyaluronic acid, a natural substance that is already present in your skin. The Restylane® expression gel can be used in a variety places including the lips, mouth, circles under the eyes, for cheek depressions, and acne scarring. Bellafill® is another filler people have been raving about, due to its longevity. The collagen in Bellafill® immediately adds volume to smooth away facial wrinkles known as smile lines, and the polymethylmethacrylate (PMMA) microspheres help your skin re-create its own firmer structure for beautiful skin. Radiesse® has also grown in popularity over recent years. Comprised of a calcium-based gel, this filler creates a scaffolding effect by encouraging and supporting new collagen growth. Radiesse® can be used to eliminate dark hollows beneath the eyes, create cheekbones, fill deep creases, and more. Another filler you may consider is Belotero®, an injectable filler that can help you get the rejuvenated, youthful look you want. Of course fillers are not the only way to feel young and vibrant. 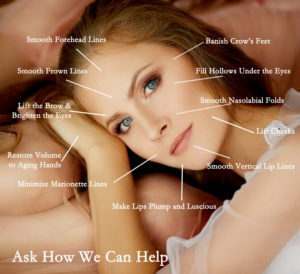 ARC offers a variety of non-injectable treatments, including facials, microdermabrasions, chemical peels, non-surgical face lifts, permanent makeup, hair restoration and Ultherapy®; an FDA approved non-surgical facial skin tightening procedure for firming and improving the tone of your skin without any downtime. Ultherapy® accurately targets and deposits the ultrasound energy precisely where it will be most effective. You could also opt for micro needling and scar correction. This treatment involves using the latest micro-needling technology; a pen-like medical device and a 12 micro-needle sterile cartridge. It can give you great results in terms of getting rid of scars including acne scars. As you can see, the Aesthetic Rejuvenation Center has many services and treatments that will get you back to a radiant, youthful glow. If you are looking for cosmetic procedures, fillers, facelifts or more in the Bergen County, New Jersey area, look no further than the Aesthetic Rejuvenation Center.